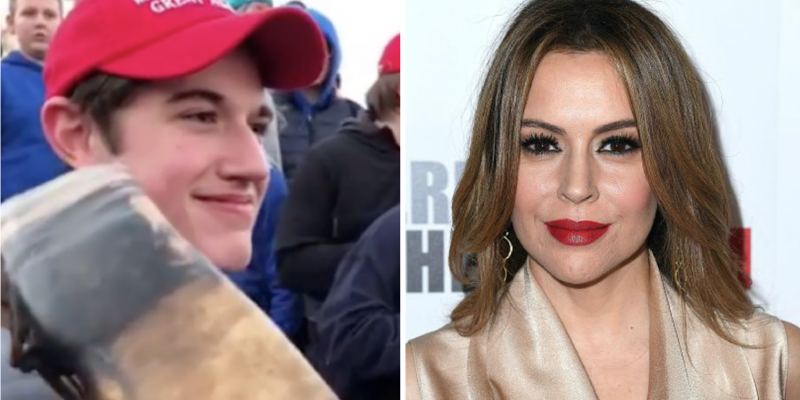 Nick Sandman, the Covington Catholic high school student who was bullied and falsely accused of harassing a Native American man who was paid to protest at a pro-life rally and march, is suing individuals and organizations for libel and defamation. And the list is pretty long. His attorneys are preparing letters for possible libel and defamation lawsuits, the Cincinnati Enquirer reported. Recipients include Illuminati actress Alyssa Milano, Senator Elizabeth Warren, fake news journalists Maggie Haberman and David Brooks, and fake news media outlets like TMZ, CNN, and the New York Times. The dioceses of Covington, Lexington, Louisville, and Baltimore have also been named as potential recipients as well. “We want to change the conversation. We don’t want this to happen again. We want to teach people a lesson. It was widely reported that the Covington students “surrounded” the Native American man and “taunted” him, chanting “build the wall.” But videos later aired proved the students never moved and never chanted “build the wall.” Videos also proved it was the Native American group led by Nathan Phillips that approached the students. Nearly every initial report on the incident falsely portrayed the students as aggressive when in reality they weren’t. Assisting McMurtry is the high-powered law firm of L. Lin Wood of Atlanta. Wood’s previous clients include the falsely accused Atlanta Olympics bomber and the family of murdered beauty contestant JonBenet Ramsey.